Finely chop the garlic and bird’s-eye chilli, and finely slice your spring onion. Crush the Sichuan peppercorns with a mortar and pestle. Mix all the sauce ingredients together in a small bowl or ramekin. BUILD YOUR WOK CLOCK: place your sliced onion at 12 o’clock, then arrange the peppers, dried chillies, chicken bowl, crushed peppercorns, garlic, bird’s-eye chilli, sauce bowl, cashew nuts and spring onions clockwise around your plate. Heat 1 tablespoon of vegetable oil in a wok over a high heat until smoking-hot. Add the onions, red peppers and dried red chillies and stir-fry for 1–2 minutes, until the onions are lightly browned and slightly softened. Reduce the heat to medium (so as not to burn the onions), push the veg to the side of the wok and add ½ tablespoon of vegetable oil to the centre. Bring the wok back to smoking point, add the chicken and stir-fry 3–5 minutes until golden brown on all sides. 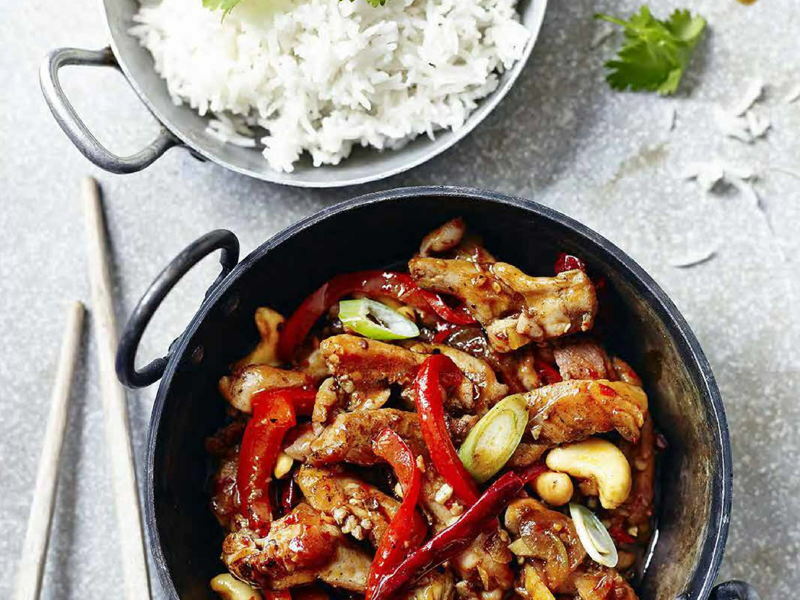 Add the cashew nuts and cook for a final 30–60 seconds, tossing the wok to combine all the ingredients well. Tip onto a large plate and scatter over the spring onion to finish. Serve. ‘SWAPSIES’: Can’t find Sichuan peppercorns? Swap them out with a mix of crushed juniper berries and chilli flakes. TIP: If you’re a keen chilli eater and fancy something with a little more punch then throw in a mixture of different types of chillies here: dried or fresh, whatever you can get your hands on.